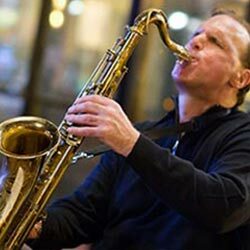 John has over 30 years of professional performing experience as a solo performer and as a saxophone soloist with many of Central New York’s finest professional bands. John’s Solo music is highly diversified covering a wide spectrum of musical styles. Solo saxophone engagements have included, wedding ceremonies, church liturgies, funeral services, post funeral gatherings, and charitable fundraisers including a performance in the 'jazz cigar tent" at the Landmark Theatre Palace Gala. John is available as a solo performer or soloist in the following formats: • Solo saxophone (unaccompanied) • Saxophone soloist with your piano, organ or guitar accompanist.